Ready to start investment casting? Full list of alloys poured at Eagle Precision Cast Products, Inc. Please note that by providing your information above, you are authorizing the Eagle Group to contact you with relevant information, offers, inquiries and other communications. You will be free to opt out of automated emails at any time. 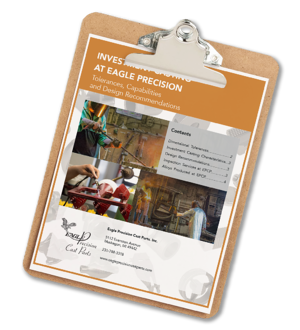 From concept to completion, The Eagle Group’s diverse capabilities offer solutions for multiple casting needs. Our lean manufacturing process ensures timely production and delivery of your cast parts. The synergies that all Eagle Group companies share assure that your casting and/or machining requirements are met with the best process for the application. Magma 3D Model Simulation assures that we are producing the very best casting for your needs. We are also involved in the growing 3D printed molds market. Together, we cover the full spectrum of any project that you may have.